"Zibarro," the Bizarro-Bizarro, meaning, he talks normally and is like us, wanders with Superman, trying to find a way off planet. In the process, they run into "Le-Roj," The Bizarro World equivalent of Jor-El, who has rocket plans, but, since Bizarro World never blew up, he's still alive. Superman pleads with both for help. Dr. Quintum tells Lois that Superman's prospects are grim. He accidentally lets slip that Superman is dying. He then points out an irregularity hiding in the sun. Superman, puzzling out the Bizarro speech patterns, gives an oratory urging the Bizarros to help him build his rocket. They agree, and call on the Bizarro Justice League, a Green Lantern who can't think his thoughts into being, a Flash who goes two inches an hour, and a Wonder Woman who is a clay statue. Asking where Batman is, it's revealed that he was shot by his parents. Superman begins succumbing to the Red Sun, but Zibarro urges him to regard his works before he leaves, and find a way off the planet. The All-Night ceremony begins, and the Bizarros do a backwards National Anthem as the Bizarro World retreats to the Underverse. Superman collapses, and Zibarro considers taking his place. Instead, he does the right thing, ties Superman to the rocket, and takes a match from the Flash, who finally arrives the three paces from where he arrived to the rocket. 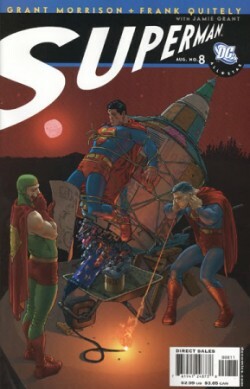 At the last second, the match blows out, and a Bizarro, frustrated with Superman, lights the rocket with the bonfire, launching Superman into space. Lois is informed that the Underverse is gone, and with it Superman. Zibarro waves from the ground. Story - 5: Incredible story. Just fricking incredible. The answer to all of the complaints I've had about Bizarro for YEARS. No one, but no one has gotten the verbiage right of late, and this comic takes it to a whole new level. I literally was sitting there, cracking myself up, the whole issue. The Bizarro national anthem is hilarious. The JLA where Batman got shot. Good God, I shouldn't have eaten cherries today, of all days. Zibarro, Le-Roj, the JLA, all just incredible creations that I believe will come down in the future and become part of canon. If you're gonna insert your own concepts, this is a damned good way to do it. Insert obligatory comment about the lateness and my consterning remarks HERE. Actually, go read my Action Comics #851 review. It's the same rant. There's no reason that this couldn't come out in a timely fashion, and we would wait, particularly for work like this. It's greed. As much as I lament the schedule, I'm now really, really sorry that there are only four more issues with this team. I hope DC ponies up the cash for these guys, and establishes a regular schedule. I think my favorite moment, however, is Zibarro staring up, before a Statue of Liberty holding... a nunchuck. That's some good Bizarro, right there. I tried to find a moment where the dialogue was wrong. I couldn't find one. It's crafted like all hell and really, really well written. And hey, there is ONE major plus in the book's lateness. It's still beating Kubert's speed. Art - 5: There are a few shortcuts, or maybe failed moments of mood, for instance, a number of missing backgrounds, particularly in the Lois scenes. Here's where people would berate me, saying, "You want speed, but you want backgrounds, too?" Screw the berating. Yes. I expect a complete comic every month, or an editor wise enough to delay publication until one can be produced, yes. But beyond that, Quitely has completely grown on me, to the point of finding his work online and realizing he has a pseudonym and lives in Scotland. Interesting. I love his work, I really do, I just wish that the people releasing it would have enough common sense not to put it on a monthly or even a bi-monthly title. Give him broad, epic stuff to do, and release it when it's in the can. But otherwise, genius as ever. Cover Art - 5: I've been staring at the cover on my desk all week, and I'm loathe to move it for the next review I have to do. It's just really, really well lit, well drawn, and has levels of detail that keep popping out at you. It's so good you can completely regard the typical discrepancy of story between the picture entailed, and just really be pulled into the story from this cover. Astoundingly good.